Life is full right now. I really want to say life is crazy right now, but isn’t it always? After all, life is just a series of events, and it never stops. As they say, time marches on. So, even in the midst of all that is to be done, yet to come, not done… I must face the fact that everyone still wants to eat, and so I must keep cooking. At the same time, lest I sound like I am complaining, I confess I find great comfort in cooking and sharing a meal with my family. Maybe it’s because it brings us together in some uninterrupted time. Maybe it’s because it brings a sense of normalcy. Maybe it’s because there really is both physical and spiritual nourishment in breaking bread together. 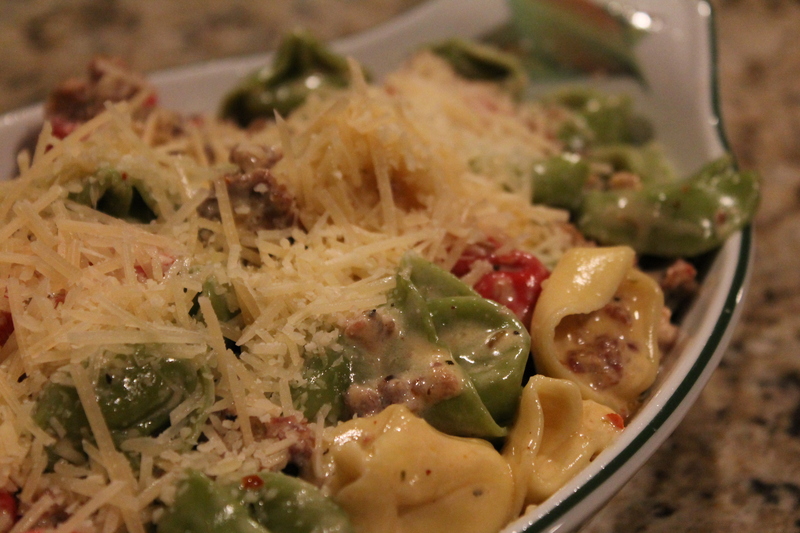 One of my favorite “go to” comfort meals is Italian Sausage Tortellini Carbonnara. I think I first found the recipe in a Southern Living magazine, but have long since lost it and rely upon memory and my own little “additions”. This dish can be doubled and freezes well. It is to my family the ultimate comfort food and I must say is in high demand from friends and families when there is a new baby or illness. Top it off, it’s easy! Begin with 1 pound Italian Sausage. I buy the sweet kind, but if you like heat, go for the spicy. Brown the sausage and drain. 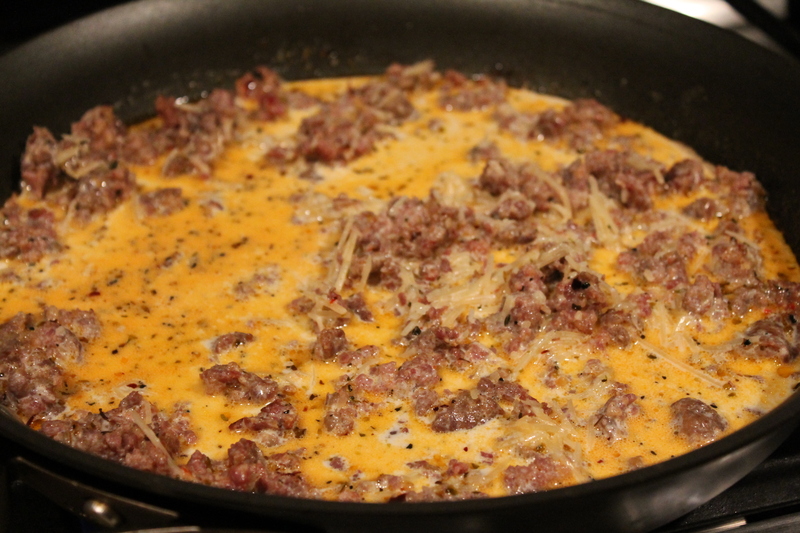 To the sausage add 1 TBSP minced garlic, 1 tsp dried basil, 1 tsp dried oregano and a sprinkling of red pepper flakes. Pour over the sausage mixture 1 cup of heavy whipping cream (I did not say this was a healthy recipe, I said it was a really yummy recipe). I have on occasion used fat free half and half (only 3/4 a cup) Add 4 oz shredded or freshly grated Parmesan. Heat this mixture over a low heat until it comes to a gentle bubble and the cheese begins to melt. While preparing the Italian Sausage mixture, cook one package of cheese filled tortellini per package directions. Drain the tortellini. In a large skillet or bowl combine the Italian Sausage mixture and tortellini, gently coating the tortellini. Pour into a lightly greased 9×13 pan. Sprinkle with Italian Style breadcrumbs (optional) and 4 oz shredded/freshly grated Parmesan. Bake at 350 degrees for about 25 minutes-until top is slightly browned. Serve with salad and garlic bread. Gather your family around the table and create some normalcy. Enjoy breaking bread together. Breathe deeply and fellowship around the table. Let meal-time be the time to pull away from the “crazy’ pace and events of the world and refresh, nourish, fellowship. ← Can We Even Know Him in the Good Times?